Order a Kindle verson of You're a Republican at Amazon.com now! Bonnie Thomas, with the Foothill Lincoln Club, writes: "Have you ever been nervous about opening your mouth about politics? Have you had anxiety about alienating those who feel differently about public policy? Has there been a situation where you have been timid about expressing your political opinions for fear your brain will freeze up and you will not know what to say or you worry you will become defensive? If so, this is the book for you!!!! Dr. Paulson hands you the key to be able to persuade people to listen to your point of view and not feel attacked or demeaned. He also delineates how to be articulate while discussing your thoughts in a well-organized, gracious and persuasive manner. ...Clarity is the answer. You will NOT be sorry you read this book. I keep it handy as a reference." Appreciate the Pillars of Republican Values — Tax relief, smaller government, educational excellence and the American Dream. Understand how America's strong military and free market capitalism are critical to the future of our republic and to lasting world peace. Use a self-test to identify what you believe on the values and issues that separate Republicans and Democrats. No boring position papers here — just straight talk over dinner about political principles and issues that make a difference for America and its future. Pull up a chair and listen in! "The American Dream is built on principles and driven by passion. You're a Republican! lets readers rekindle their passion for the principles that make this country great. Don't miss this thought-provoking book." "Finally, a book that gets Republican principles and issues across in a way that people can understand and enjoy!" "You're a Republican! is both thought-provoking and entertaining at the same time. A great read and a creative book! I really identified with all of the 'conservative' positions, but I'm afraid this might make me a Republican rather than the moderate Independent I think I am! Do an encore on some of the other tough issues!" If you don't have a Kindle Reader, download a FREE APPLICATION FOR YOUR tablet, iPad, iPhone, PC, Mac, BlackBerry, or Windows Phone 7 now! Then download Dr. Paulson's book and start enjoying today! 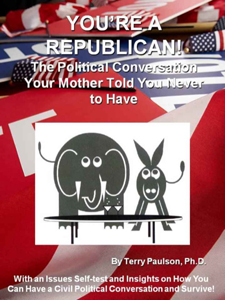 Order Dr. Paulson's eBook You're a Republican! securely at Amazon.com now!